Kitchen Bouquet has been available for well over 100 years and it can still be purchased today at among other places, Walmart and Target. A browning and seasoning sauce for soups, sauces, gravies, roasts and stews it was developed by Jules L. Tournade and originally manufactured by the Palisade Manufacturing Co. of West Hoboken New Jersey. A story printed at the time of his death, in the July 17, 1891 issue of the N.Y.Times briefly mentioned his background and early history. Mr. Tournade was of French birth, his native town being La Rochelle, France, where he was born in 1836. He came to this country in 1857 in company with his cousin, Jules G Tournade, who is engaged in the importing business at 25 South William Street, with the firm of Gourd & Tournade. Mr. Jules L Tournade was at first in business with his cousin and was a member with him of the firm J & J Tournade. This firm, however, dissolved in 1869, and since then Mr. Jules L. Tournade had been in business in New Jersey. He had been successful in business. He leaves a wife and one son who will probably succeed his father in the business of the company. J&J Tournade was last listed in the 1868-69 NYC Directory confirming that the company did come to an end around that time. However, it appears that Jules L. Tournade remained in business in New York through much of the 1870’s where he was listed in the NYC directories as either a merchant or importer. According to an early listing of New Jersey corporations, he started the Palisade Manufacturing Company on July 5, 1881 at 247 Clinton Avenue in West Hoboken. The first listing I can find for the company was in the 1883 Jersey City Directory with an address of Clinton Avenue near Chambers. Jules L Tournade and his son, Emil Tournade were also listed individually at the same address with the occupations of president and salesman respectively. Jules L. Tournde, proprietor of the Palisade Manufacturing Company, Clinton Avenue, West Hoboken,N.J., was fatally injured on the Paterson Plank Road, opposite Second Street, Hoboken, Wednesday afternoon, and died shortly afterward at his home. Mr Tournade had recently purchased a team of horses and had taken them out in company with Mr. Frank Davis of the Davis West Hoboken Express to accustom the horses to the railroad and elevated trains. On the way home along the plank road the reins became entangled and the horses began to back. In attempting to get out of the wagon Mr. Tournade slipped and his foot was firmly wedged between the shaft and the axle. The horses continued backing, and forced the wagon near the end of the road. A moment later it went over, followed by the horses, and all struck on the jagged rocks, fifteen feet below. Mr. Davis in the meantime had succeeded in getting out of the wagon, but Mr. Tournade suffered fractures of the ribs and skull. He was taken to his home, but all efforts to save his life were without avail. His son apparently continued on in the business but for how long is unknown. The 1900 census records listed Emile Tournade’s occupation as “syrup maker” but he’s nowhere to be found in the 1910 or 1920 census records. I guess it’s possible he went back to live with family in France? In any event, the Palisade Manufacturing Company was still listed at 247-249 Clinton Avenue in the 1918 Industrial Directory of New Jersey. Located near the intersection of Clinton Avenue and Chambers Street, certain advertisements during this period include 18 Chambers Street as their address. In 1923 the Foulds Company was formed by the consolidation of the following companies: The Foulds Milling Co., Chicago and Libertyville; Warner Macaroni Co., Syracuse N.Y.; Woodcock Macaroni Co., Rochester N.Y.; Palisade Manufacturing Co., manufacturers of Kitchen Bouquet, Hoboken N.J., and just recently the acquisition of the Cone Company of America, making the well-known Havacone ice cream cone, which gives another product closely allied with the macaroni industry. According to the January, 1924 issue of the Wholesale Grocery Review, a year later the business was still operating under the control of the Foulds Company but was then called Kitchen Bouquet Co.
C S Foulds has succeeded his father, who died recently, as president of the Foulds Co. Mr. Foulds was formerly secretary and sales manger of the Foulds Milling Co. The Foulds Co., with executive offices at 522 Fifth Ave., New York City, controls The Foulds Milling Co., Warner Macaroni Co., Woodcock Macaroni Co. and Kitchen Bouquet Co. The officers are C.S. Foulds, president; G.E. Warner, 1st vice-president; H.H. Mills, vice-president; R.M. McMullen, treasurer; A.H. Wheatmore, secretary. During this period Kitchen Bouquet advertisements utilized the Foulds Manhattan executive office address of 522 Fifth Avenue. 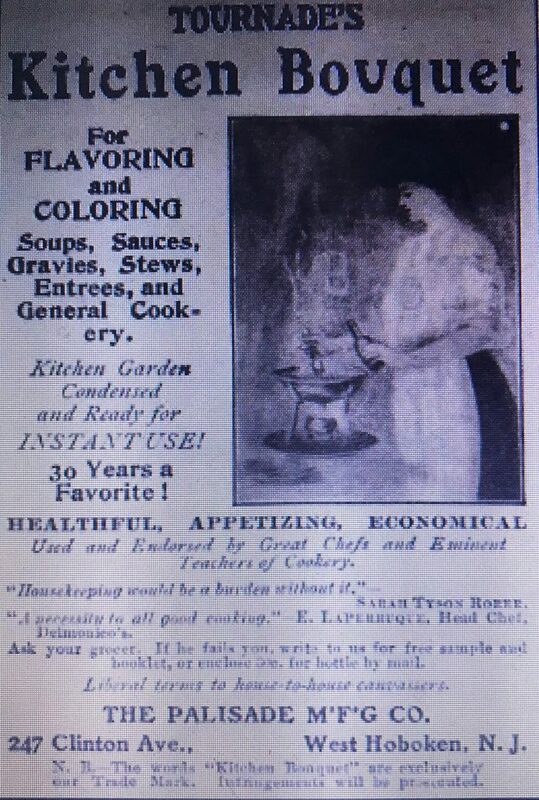 In 1929 Kitchen Bouquet was acquired by Grocery Store Products, Inc. The August 23, 1929 issue of the Brooklyn Daily Eagle reported the transaction. The formation of Grocery Store Products, Inc. which will immediately acquire four operating food companies and is contemplating the acquisition of additional companies, was announced today…The four special food companies, practically all of the stock of which will be held by Grocery Store Products, Inc., are the Toddy Corporation, manufacturer of a chocolate flavored malt food drink; Would Milling Co., a leader in the production of quality macaroni products; Kitchen Bouquet, Inc., manufacturer of liquid flavoring products, and Edward H Jacob, a company which produces the major portion of the canned mushrooms produced in the United States. Grocery Store Products continued to make Kitchen Bouquet for the next four decades until the Clorox Company acquired the Kitchen Bouquet brand in April 1971. According to their web site, this marked the company’s entrance into specialty food products. This would put the product’s start back in the early 1870’s, but that’s probably a stretch, recognizing that Jules L Tournade was working in New York as an importer/merchant at the time. It was certainly in existence by 1889 because it was exhibited at the Paris Exhibition that year. I’m guessing it was developed in the early to mid-1880’s after the Palisade Manufacturing Company was formed. 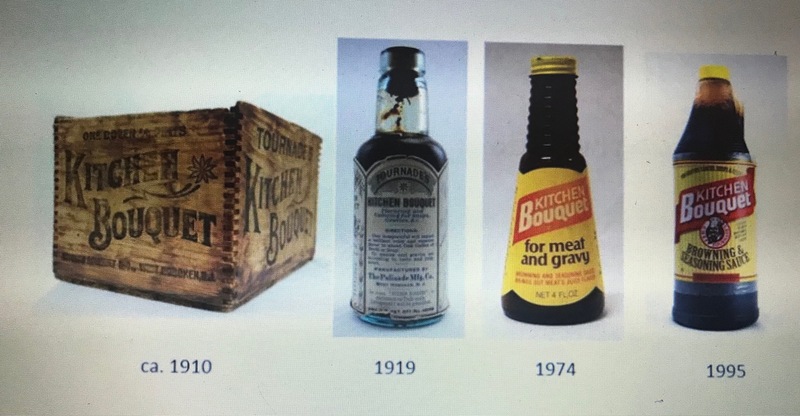 Originally listed as a candy manufacturer and confectioner, they would have been familiar with some of the ingredients that ultimately were included in the sauce, such as caramel. Today, the original recipe is one of the oldest items, and the only confidential asset, in the Clorox archive. The Clorox Company web site shows several of the Kitchen Bouquet containers utilized over the course of their history. The bottle I found is machine made and matches the labeled bottle dated 1919. It’s embossed Tournades Kitchen Bouquet on the base. 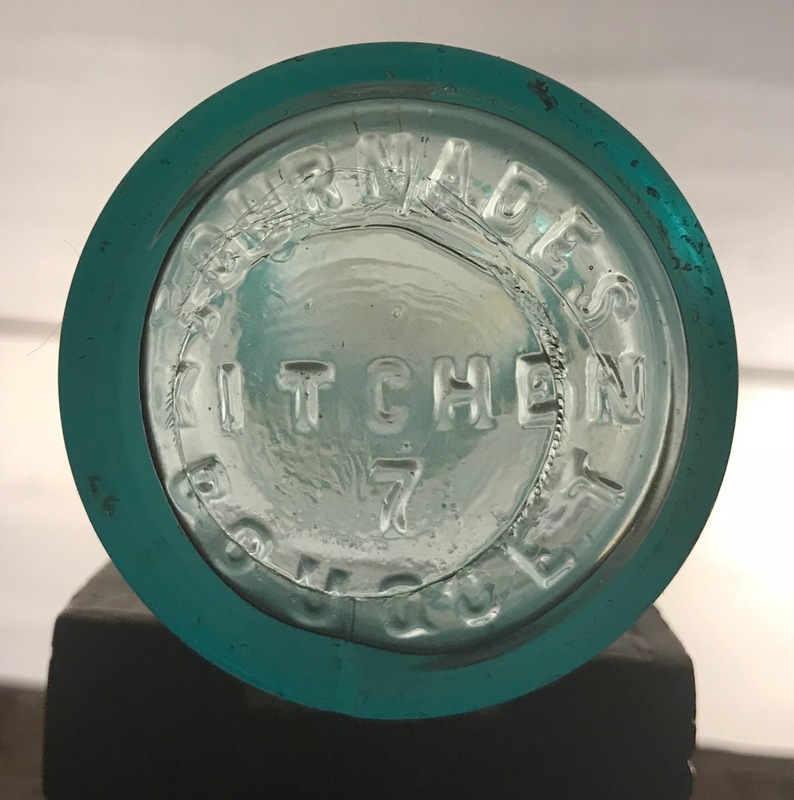 The 1919 time period puts it’s manufacture with the Palisade Manufacturing Co. which agrees with the label on the pictured bottle. Author baybottlPosted on October 10, 2017 Categories Condiments and SaucesTags ABM, antique bottle, Foulds Co., Grocery Store Products Inc, Hoboken NJ, Palisade Manufacturing Co.